Love the hair. Do you take these pictures yourself or does someone take them for you? I saw a fashion blogger in the ice storm taking pictures for her posts and shivering between takes and thought about you! Completely agree on the black pencil skirt being a staple in every wardrobe, I have one and don't know what I'd do without it! Doesn't hurt that it was only $11, came with a thin gold belt, AND is from Target. I love the look of your coat! I'd probably spill everything on it haha! 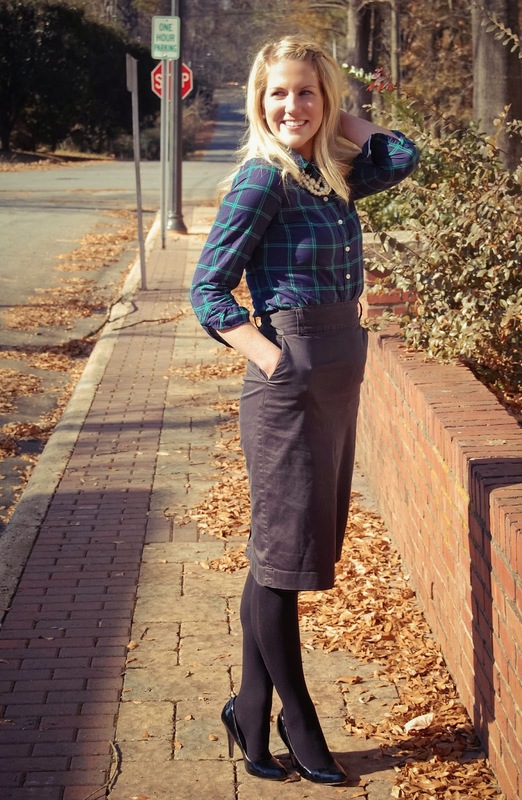 waded up or not i love this look, and agree, every closet needs a pencil skirt! i love your coat and your hair like that! and the story sounds JUST like me... im always changing in the car, haha! I just discovered your blog and love it! Your children are so cute and you are so beautiful! I hadn't noticed that your skirt was wrinkled. Even if you were wearing it while you were in the car (instead of your pjs), it would have some wrinkles, so don't worry about that, it looks great. 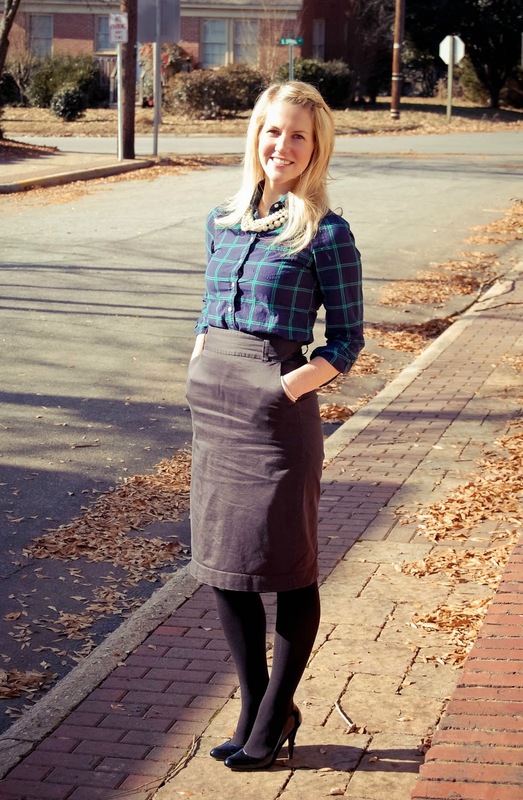 I agree that a black pencil skirt is a "must-have" piece of clothing. I love pencil skirts. They are so chic and feminine. Your plaid shirt is so beautiful and you look so pretty in this outfit! I didn't even notice the skirt! Maybe that's a warning sign about my clothes' wrinkle levels... Anywho, I love how you did your hair and after a lifetime of changing in the car before my dance rehearsals I totally respect the necessary car change. You. Are insanely pretty and adorable, and I'm obsessed with you. Kbye. Wrinkled or not, you look fab! And I totally would have done the same thing! Oooo what a pretty coat! I'm thinking I need a plaid shirt like yours... right? I love your style! I just came across your blog via SBS and I love it! How cute are you?! I love this outfit!!! Ironing at 6am is not happening in my house either :) Love your look. Dropping by from the Random Wednesday Linkup! I really like your plaid and pearls! So cute! And I swear half the time I'm walking around wrinkled, so no apologies necessary! You look so cute, Ashley! Love the whole outfit!! I didn't even notice the wrinkles silly:) you look darling! love the hair style so much! I didn't even notice the skirt was wrinkled! You look great! 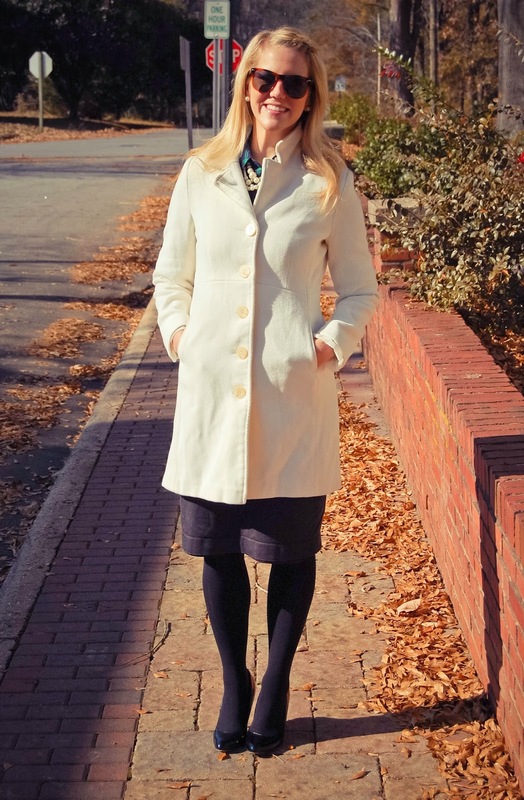 I love that coat! You look so pretty!! I love a good black pencil skirt. Mine is now too small for me after the second child. I suppose I should look for a new one! So pretty, I love the pockets! It requires quite a large degree of physical strength to dance with the bata. These skirts can weigh up to five kilos and the dancer has to lift them in a ballet-like arabesque using the ballet technique of plié in order to do so.